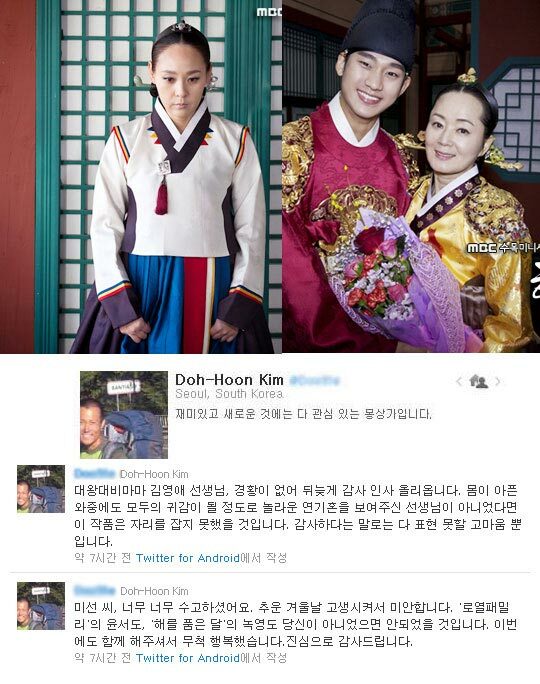 The PD of The Moon that Embraces the Sun expressed appreciation to the actresses. The role of Kim Young Ae is the central figure of consort clan standing opposite to Lee Hwon (played by Kim Soo Hyun), and has engaged in intense war of words with the master of palace Lee Hwon. Meanwhile, the role of Jun Mi Sun is the only person who knows the ins and outs of the mysterious death of Yeon Woo, her double face when treating Yeon Woo and people in palace has been well received. Both persons also by sheer luck also starred in another PD Kim Do Hoon drama, MBC TV series Royal Family, which had also achieved high viewership ratings. The appreciation by PD Kim Do Hoon is even more touching. Meanwhile, the last 2 episodes of The Moon Embracing the Sun scheduled on March 7 and 8 were canceled due to strike, and instead will air on coming March 14 and 15 of 2010 to usher in the grand finale.